It's Irie: Speedy Haul-out or “on Vacation” in Philipsburg? Irie had a little problem with one of her engines. Actually, Irie has a few problems with her engines, but this one became a bit more worrisome when the blue turned black saildrive oil also rose in level. This indicated one thing: salt water was coming in. 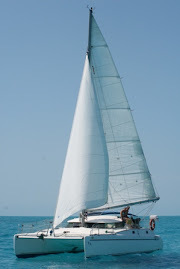 The only way to deal with saildrive issues is… to haul the boat. Didn’t we just do that a few months ago in Grenada? Yep. We just had to do it again. 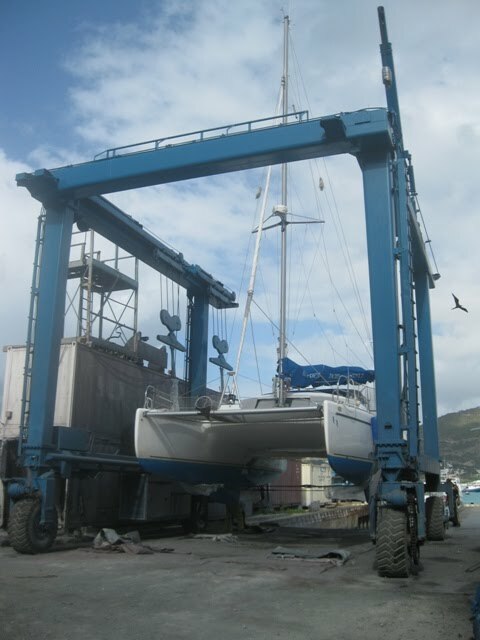 Luckily, there is an affordable boat yard in St. Maarten and Irie snugly fits in its travel lift. 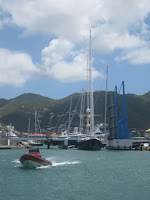 On the first day of spring (after a winter that never came), Irie and her crew left the lagoon, heading for Philipsburg. Mark and I felt a bit excited about finally leaving the nasty “pond”, albeit for the wrong reasons. The cleaner water in Great Bay invited us for a swim and the long boardwalk and wide beach called Darwin for a long walk. Even the chaos of the cruise ship passengers and ferries couldn’t spoil our fun of being in a relatively beautiful place again. 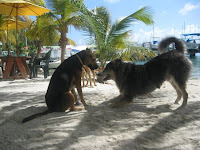 When Monday morning came around, we moved Irie towards the fairway at Bobby’s Marina. 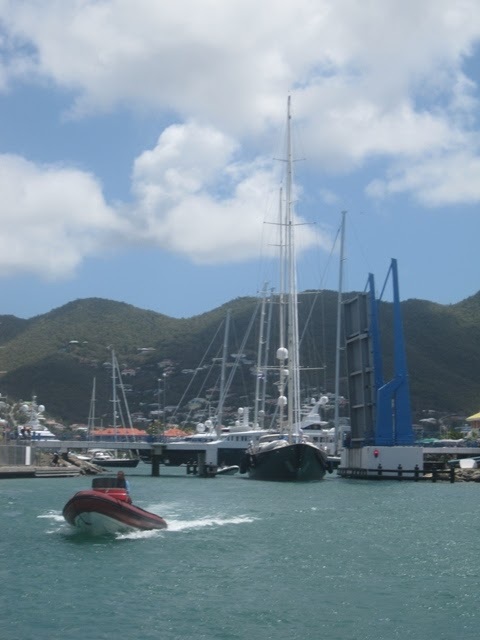 A heavy cross wind caused us problems to dock the boat and, with only one line attached to shore and a port engine that suddenly refused to work, Irie turned sideways, creating a bit of a panic. Luckily no substantial damage occurred and we managed to dock safely in the end. Once hauled out of the water, we noticed that the propeller of the port engine had come loose, the reason it didn’t work properly when engaged… An easy fix, especially on the hard. From the moment Irie arrived at her spot in the yard, Mark and I got to work. 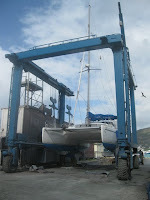 We were committed to spend as little time as possible in the hot, dusty and grimy boatyard. Darwin was placed in the shade with a blanket and a bowl of water and he was extremely well behaved. While he rested and stayed put, the humans in our little family scraped barnacles, fixed the prop, disassembled the sail drive, sanded some areas where the paint didn’t hold up and painted them, cleaned the waterline, filled the tank, sun showers and jerrycans with water, waxed a few spots, flushed the fridge hoses, equalized the batteries and cleaned Irie’s deck and cockpit. That afternoon, we treated ourselves to some peace in the anchorage, a swim to remove all the dust and another long walk with Darwin. 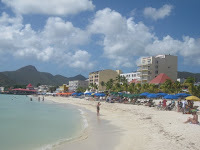 Philipsburg has its charm and we were happy to enjoy some of it, too tired to make it back to the lagoon the same day anyway. That was the plan for Wednesday morning. 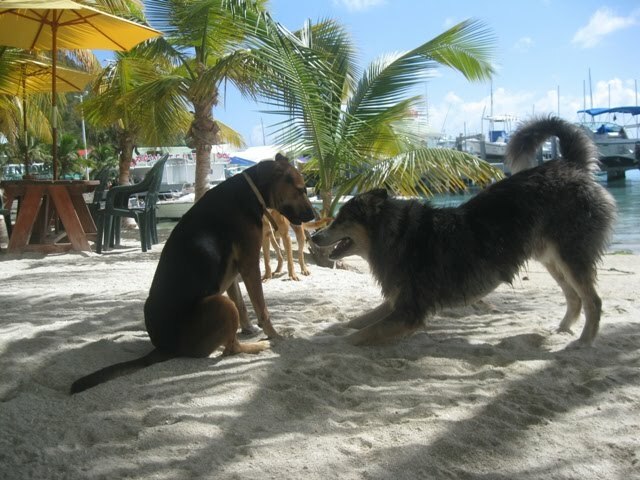 We returned to our usual spot off Explorer Island and got back to The Wirie business. Our “being out of touch” for three days, prompted people to inquire about our getaway and ask us how we enjoyed our “short vacation”. In a way, we did enjoy it, actually!